That's not to say there still isn't a healthy interest. Web camera's remain in the Top-10 of most in-demand computer peripherals. In particular, the trend towards higher-quality 720p and 1080p HD cameras have spurred a new buying cycle as Mac users sought to upgrade to high-definition and wide-screen video formats. There's also a compelling and ever-growing market for high-end group videoconferencing cams. They've enabled businesses to save a fortune on travel expenses and conduct multi-party video chats with premium conferencing cameras ideal for local and remote collaboration. Apple Internet marketers are leveraging Mac video marketing strategies keeping demand for high-quality webcams going strong. 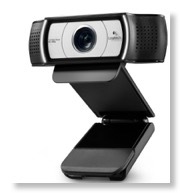 Logitech remains the Go-To brand for a high-quality web camera for Mac OSX users - at a wide range of price points. Sadly, Creative Labs seems to be phasing-out of the webcam scene - and focusing on their primary market: Premium audio solutions, speakers and headsets. Ipevo continues to deliver exceptional document cameras for the business and education markets. And the industrial camera and laboratory microscope scene is clearly moving in a digital direction. Rising interest in Apple compatible wireless security, monitoring and surveiilence cams is seriously bucking the trend both on Mac OS and iOS platforms. Of course at the low-end, China has mountains of cheap UVC-compliant USB web cameras for the low-end consumer market. It's slugging it out with mediocre webcams largely in the $10-20 range for budget-conscious buyers with lean wallets and low expectations. If you’re a MacBook owner like me, you’re probably a bit frustrated with the limited viewing angles of your Mac laptop’s built-in iSight webcam. Owners of Aluminum iMac’s or Apple Cinema Displays which also have an integrated HD web camera might feel the same frustrations as well. There’s a limited degree to which you can tilt the display and still see what’s happening onscreen. For some the versatility and flexibility of an external Mac webcam is a must-have for their video conferencing needs. An external Mac compatible webcam can be used for a variety of needs. For teachers, presenters and others - specialized document web cameras with an adjustable stand is better than trying to hold something up and still in front of a built-in iSight camera. For business meetings, an eternal conferencing camera might be used to display products and highlight details or features of an item. For others, an external webcam with a tripod mounting option like the Logitech C920 with tripod mount might give the stability or precise placement you need. Perhaps more than anything, adult webcam chat may be the single biggest driving interest in the flexibility of camera placement that an iMac or MacBook’s built-in webcam simply can’t provide. Don’t underestimate the size of the adult ‘naughty’ chat marketplace. Whether you think such online activity -- whether it’s Gay or Straight, between married couples or total strangers -- is inappropriate is moot. Literally millions of people across the globe engage in adult online conferencing, and for that purpose a PC notebook or Apple laptop’s internal camera is nothing but frustrating. Tilt the camera down far enough to expose your ‘good parts’ and you can’t see what’s onscreen anymore! Not all webcam chat is about smiling face to face interactions. The last reason to possibly want an Apple compatible external webcam is to improve the image quality over what’s built into your aging iMac or MacBook. My first-generation white MacBook had a built-in iSight webcam at 640x480 VGA resolution that was notorious for having a very reddish image. (That color problem was rectified in later models.) An external UVC web camera not only gave me much more accurate color balance, but was higher in resolution and detail which easily outperformed the internal webcam. When what’s built into your Mac isn’t good enough, consider any of the recommended HD webcams for Mac for affordable or very high quality webcam alternatives that will let you point your camera anywhere you need to. For many years, finding a Mac compatible web camera was hard to do. The lack of webcam standards and a lack of availability of webcam drivers for Mac OSX was the reason www.mac-compatible-web-cam.com came into existence. Apple computers didn't have any sort of direct driver support for web cameras in OS9. It wasn't until the release of OSX 10.4.x that the operating system even included basic support for an emerging webcam standard called UVC. 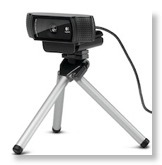 The UVC - USB 2.0 Video Class webcam specification has been a godsend in the years since. Not just for Apple computer users wanting easy, plug and play web cam support, but for Linux and Windows PC users as well. The need for manufacturers to write specific webcam drivers for each camera hardware type and operating system was greatly reduced as built-in low-level webcam driver support was now included in OSX, Linux and Windows Vista and beyond. It's also taken a few years as webcam makers started - somewhat slowly - incorporating UVC compliant hardware into their web cameras. A UVC becomes the de-facto standard for Windows, Linux and Mac compatible webcams, the real challenge is choosing the best webcam for your Macintosh, depending on your needs or budget. Whether you're looking for a dirt cheap webcam to a high-end HD web camera for OSX there's a growing number of cameras available for videoconferencing or Skype, video capture for YouTube and video sharing websites, online chat with FaceTime, iChat, or on FaceBook.